These pots were fired just before Christmas with another two, but those didn't make the grade. Badly glazed and that sort of thing. These I like, even though they aren't perfect - not quite round, a bit lumpy (the one with the flower on it) and I'd hoped that the black glaze would run down a bit more. Still, not bad. The black pot is just about 1 inch high. I spent the evening painting tiles (and chatting a lot) and when I finally thought about taking a picture, I had already glazed them and there wasn't anything to show but white tiles, so it will have to wait until they are fired in a few weeks. I've experimented with another colour. I think it is called mazarine and looks pink before firing. It will turn blue when fired, but a lighter one than cobalt, which I used for the other Delft tiles. As the bisque fired tiles are very absorbent I found the mazarine very difficult to control. The end result will have to be a lot better than the cobalt to consider using it again! I'll paint some more tiles next week as I only got 15 or so done. Too much chatting going on? Also, every 10th of the month we upload a photo of the latest embroidery project to the Petitpointers website. It's lovely to see all these projects progressing, some really fast others at a more moderate pace, like mine! 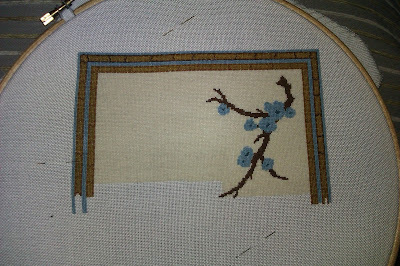 I'm almost half way, which means I've done around 21500 cross stitches so far and have about 23000 to go. It's on 32 count fabric and it's taken 119.5 hours so far! Sorry about the quality of this picture, it from my phone in low light. My house isn't that big, but big enough to lose the second battery and the charger for the camera. It's not where I would normally plug it in. Note to self: if you plug something in somewhere random, it helps to remember where that is. Or it could be that I have borrowers or gremlins, as there are a few other things hiding from me! I think they turned out great - I especially like the one on the far right... the shape is beautiful. Good idea about using the petit pointers as motivation - I think I will have to do that when I start my parlour rug, or I'll never finish it! Ik vind je potten echt schitterend. Ik vind het erg knap van je dat je dit kan en dat je het ook zo mooi fijntjes kan schilderen. De vormen van de potten zijn mooi hoor, je ziet zelf altijd wel dingen aan je werk die je zou willen verbeteren, die anderen mss niet zo zien. Your pots look wonderful Idske, I also like the flower vase the most, even if you say it is lumpy. Remember, you are just starting out on this journey as a potter, with practice and experience one's work improves with each new item, so keep at it, your painting on the vase is just beautiful. Wat een geweldige potten. Wat heb jij die uitstekend beschilderd. Hoe doe je dat ? The pots are lovely Idske - I've just shown them to Esi and she loves them too. I love the pottery! They look beautiful and so well done...very impressive. The cross stitch is also looking lovely and I look forward to seeing it done. Good luck with the phone. Thank you all for your comments, it helps to keep things in perspective. Dorien, I paint them exactly how they used to do in the 17th century in Delft/Makkum etc. There are other ways of painting them, for instance you can paint after glazing, but that is not how they did it a few centuries ago. I'll describe the whole process in the next pottery post, with hopefully some tiles to show you. I'm very lucky that Yolande, the potter, wants to experiment along with me and comes up with different ways of doing things all the time. Other than that, it's just as Elga says, practice and experience! je bent veels te streng voor jezelf, die potten zien er goed uit hoor. Ben zelf een enorme fan van blauw beschilderd dus dat is ook hier weer mijn favo werk :). Misschien is in de toekomst (ooit) de 2 kleuren blauw door elkaar gebruiken ook een optie? Vind het hartstikke spannend om je avonturen te volgen, bedankt dat je het met ons wilt delen! Ik vind de vorm van jouw vazen/potten erg mooi en de beschildering net zo. De rechtse vaas heeft mijn voorkeur, maar de linkse heeft ook iets, Japans? Je schiet bovendien al aardig op met je kleed, het is erg mooi! Succes met alles. Fijn weekend toegewenst. Hi Idske, This embroidery is absolutely wonderful! I am going to try one myself (although I am going to start with simply cross stitch!